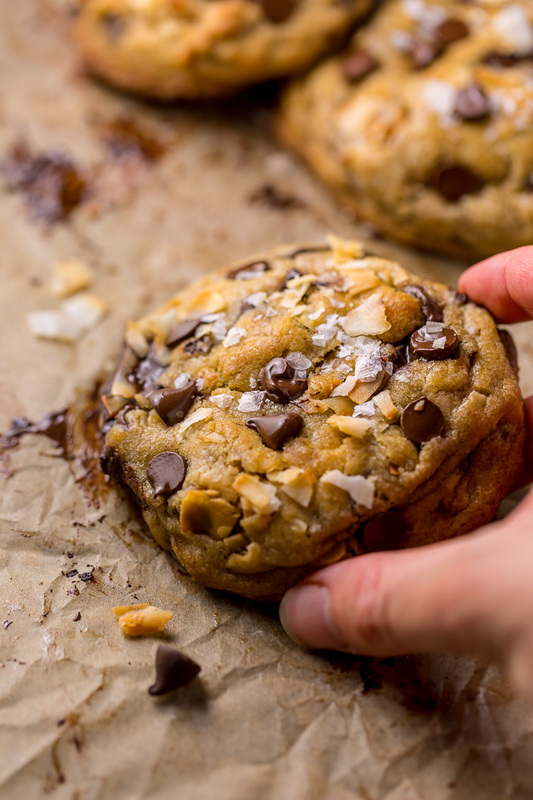 Ultra thick and chewy Brown Butter Coconut Chocolate Chip Cookies! These are so flavorful and freezer friendly! A must try for coconut lovers! Do you love coconut? I ask because this is definitely a coconut lovers recipe! 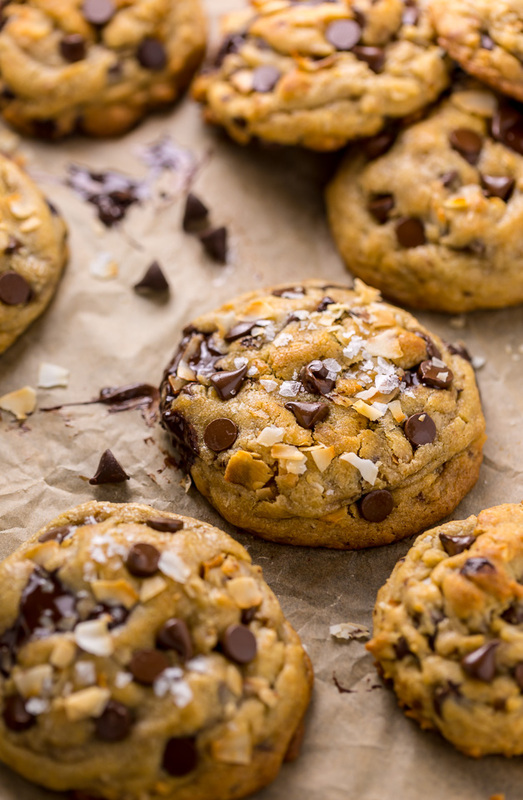 These thick and chewy cookies feature finely shredded coconut and flaky coconut, which provide maximum coconut flavor in every bite. 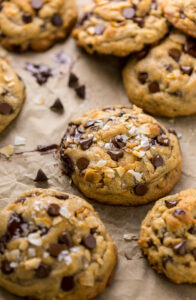 The coconut duo also adds a ton of great texture to the cookies, which I just LOVE! I probably could have stopped there… but of course I didn’t! Instead I added brown butter, tons of chocolate chips, and a dash of almond extract. 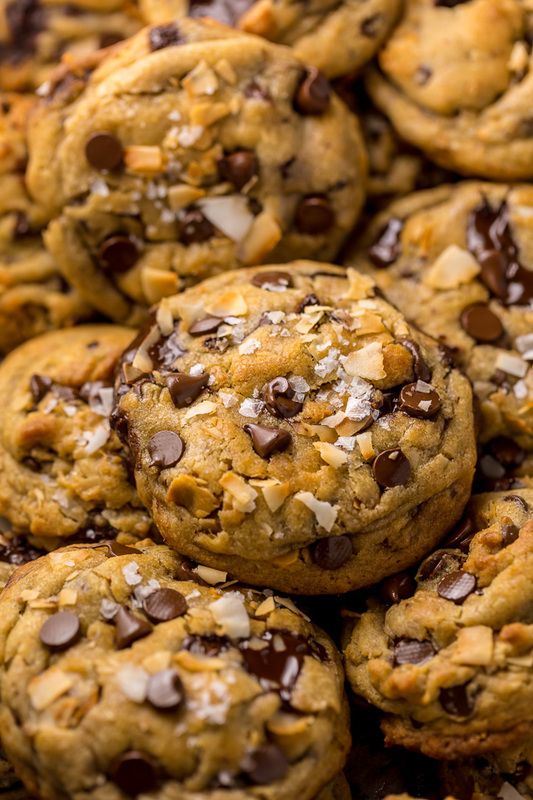 All of these ingredients amplify the coconut flavor in these cookies and make them SO extra. 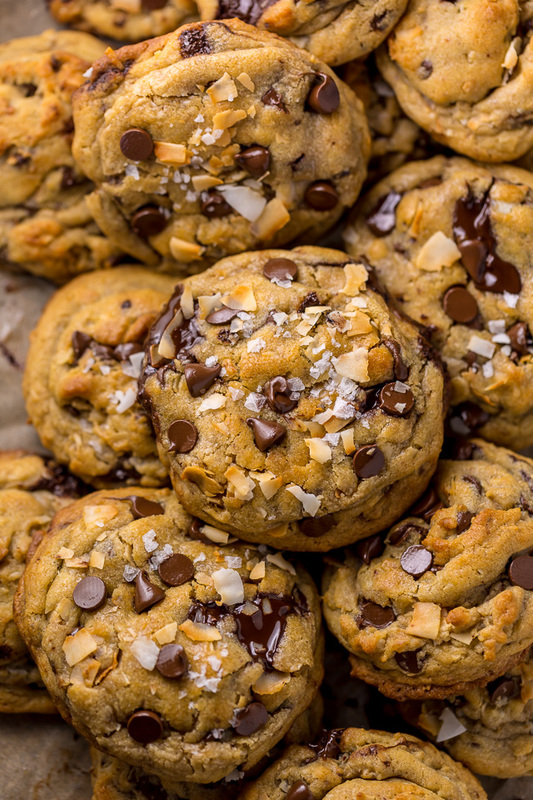 My fiancé – and resident taste tester – isn’t a huge coconut fan, but he said these were so chewy and flavorful he could easily eat the whole batch!! And in my book, that kind of endorsement equals MAJOR recipe success. The two varieties of coconut you’ll need are flaked coconut and finely shredded coconut. You’ll want to toast them both and allow them to cool completely before adding them to the cookie dough. You can use sweetened or unsweetened coconut, but personally I prefer unsweetened as these cookies are already quite sweet. I used semi-sweet chocolate chips, but chocolate chunks will work, too! I plan on making these this weekend with my #1 love: Lindt 70% EXCELLENCE Bars! While I don’t recommend skipping any of the ingredients, the almond extract may be omitted if you’re allergic or not a fan. But please note, omitting this ingredient will change the overall flavor of the cookies. Next, let me ask you a question: do you know how to brown butter? If you do, feel free to skip this lecture. But if you don’t, I’ve got you covered! Browning butter is insanely simple and I’m going to walk you through each step! To brown butter you’ll need a skillet or pan, butter, and a little patience. You’ll melt the butter as normal, then continue to cook it over medium heat – stirring occasionally – until it reaches a golden brown color. Watch your butter closely as it browns, because it can burn easily! Once it’s nice and golden brown, remove it from the heat and pour it into a heatproof bowl – being sure to scrape all of the golden bits off the bottom of the pan. And that’s it! Easy, right? Because the brown butter must come back to room temperature before using it in the cookie dough, you’ll want to plan ahead time wise. It will take about 3 hours, so plan ahead! The good news? Although the butter must chill, the cookie dough does not! You can just roll and bake. And finally, if you love sweet and salty, you can sprinkle these cookies with some flaky sea salt right before serving. It’s so good!!! OH! And be sure you don’t over bake these cookies! They only need 9 to 10 minutes in the oven, and will firm up quite a bit as they cool. 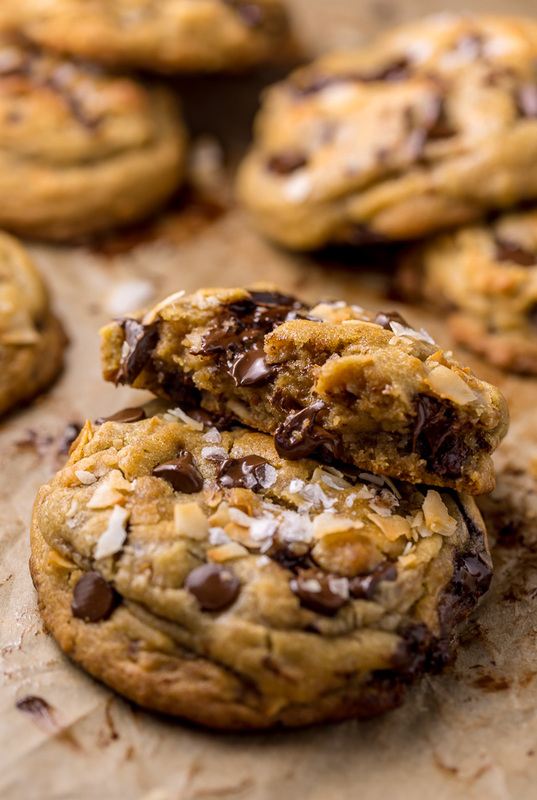 Over baked cookies will be dry and crumbly… not chewy like we want! 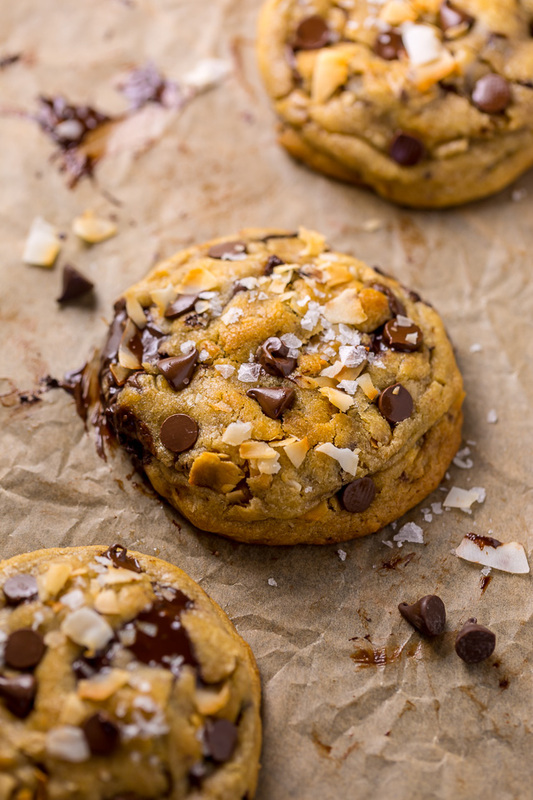 If you try this recipe for Brown Butter Coconut Chocolate Chip Cookies, please let me know what you think! Leave a comment below, and don’t forget to snap a pic and tag it #bakerbynature on instagram! Seeing your creations seriously makes my day! 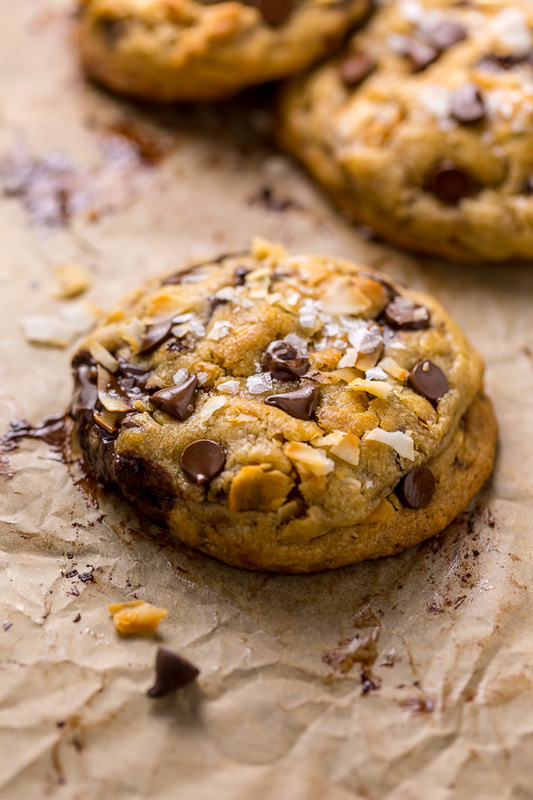 These Brown Butter Coconut Chocolate Chip Cookies are ultra thick and chewy! Preheat oven to 325 degrees (F). Spread both varieties of coconut onto a large baking sheet, being sure the coconut is spread in an even layer. Bake in preheated oven for 4 to 6 minutes, or until lightly golden. Note: the coconut will toast very quickly and won't take more than 5-10 minutes. Remove the coconut from the oven and stir a few times before transferring to a plate to cool completely. DO NOT LEAVE THE COCONUT ON THE TRAY! Place the butter in a small saucepan over medium-high heat and cook for about 3 minutes – stirring almost constantly – until the butter has browned. Pour the brown butter into a heatproof bowl, being sure to scrape all of the "toasted" bits into the bowl as well. Place the bowl in the refrigerator for 2 hours, or until the butter is at room temperature. You’ll know the butter is at room temperature when you press a finger into the top and it makes a slight indentation. It should not be liquid at all. Once the butter is at room temperature, you're ready to get baking! Preheat oven to 375 degrees (F). Line two large baking sheets with parchment paper; set aside until needed. In a large bowl combine flour, salt, cinnamon, and baking soda; whisk well to combine then set aside until needed. In a large bowl using a handheld electric mixer, or in the bowl of a stand mixer fitted with the paddle attachment, combine the brown butter and both sugars and beat on medium-speed until light and fluffy; about 2 minutes. Add in the almond and vanilla extracts and beat until combined. Add in the eggs and yolk, one at a time, beating for 15 seconds after each addition. Turn mixer off. Using a wooden spoon or sturdy rubber spatula, gently fold in the flour, stirring only until the flour begins to disappear. Fold in the chocolate chips and coconut. Roll 3 tablespoon sized scoops of dough between your palms to form a ball (they should be big; almost a 1/4 cup), then place on prepared sheets, being sure to leave enough room in between each cookie for inevitable spreading. Continue this process until all the dough has been rolled. Place baking sheets in preheated oven, one at a time, and bake for 9 to 10 minutes, or until golden at the edges but still soft in the middle. Repeat with all cookie dough. Sprinkle cookies with sea salt right when they come out of the oven. if desired. Let cookies cool for 10 minutes on the baking sheet before transferring to a wire wrack to cool completely. I made this cookies yesterday. This is awesome recipe. We love it. Instead of chocolate chips I using toffee chips, and worked perfectly. I tried most of your recipe anyways. Thanks again Ashley. Love this recipe! Soooo good! Thanks Ashley!! I’m new to your IG and I LOVE your posts…. I wasn’t able to find flake coconut so I used all shredded; my cookies don’t look *exactly* like the pictures but they taste and look great! They are super fluffy – I love the thickness. The almond flavor almost overpowers the coconut even though I toasted mine really nicely. I’d probably reduce it a bit for my next batch. 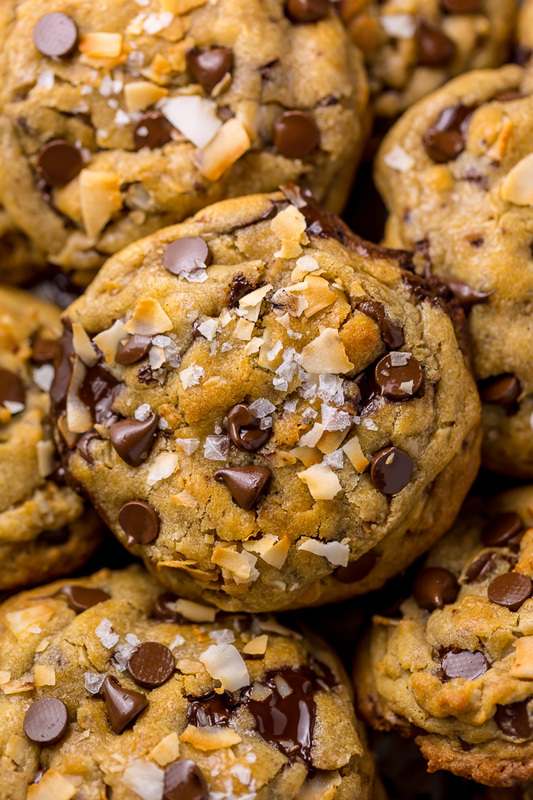 I was worried these wouldn’t turn out well with all the extra things – browned butter, toasted coconut, etc., but they ended up being pretty easy! Thanks for this unique recipe! GOOD LORD – these are about the best cookies I have ever made or had!!!!! The texture is unbelievable, and the brown butter is heaven – wow wow wow. My 9-year old nephew is quite the cookie connoisseur and a very honest critic. And he said they were “perfect”. Crispy outside, soft and chewy inside, and just delicious. I did reduce the sugar by a 1/4 cup – I would maybe do even more next time – I like a little less sweet cookie. I made it Gluten Free with King Arthur Flour and 3/4 tsp of guar gum. perfect. Yes! Just add a few minutes to the bake time. And if you’re going to scoop the dough after placing the bowl in the fridge, let it come to room temperature before scooping (otherwise the dough will be really challenging to scoop). Hello. Can I freeze the cookie dough? Really excited to try these!